Not something often seen in the well managed garden, stem tubers on a volunteer potato plant. Whenever I become enthusiastic about getting involved in permaculture I have to pinch myself hard and remember just what the permanent crops in my garden have to put up with already. 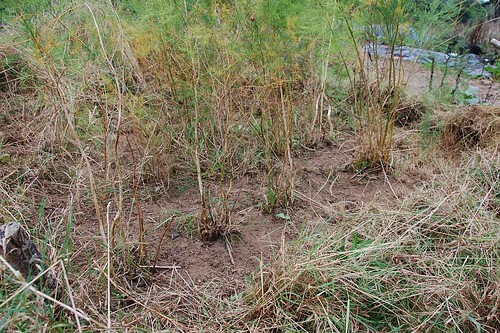 Very untidy asparagus bed after a rough clean up. 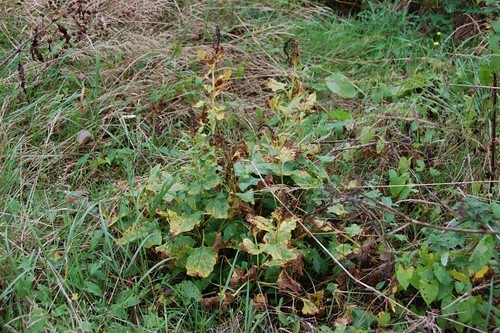 The intention is to give it thick mulch over winter in an attempt to keep the weeds down. I'd love to be able to complain that there's just too much for me to do but the sad truth is that if I put a bit more effort into the tidying up both in the house and the garden things would be a lot more civilised. This summer I directed my meagre efforts elsewhere and promptly lost control of the long term residents under a morass of noxious weeds and detritus. 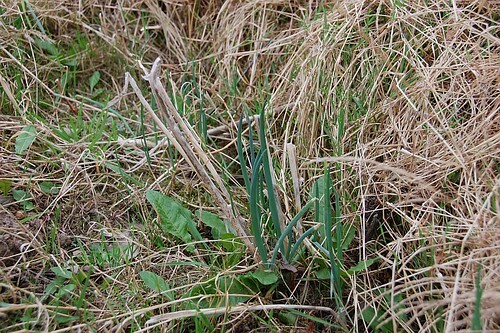 There are half a dozen poor little Welsh onion plants waiting for new accommodation. So a task for this rather splendidly mellow autumn is to rescue what I can from my abandoned babies and re-home them in a clean bed, even though I know that they'll most probably become overgrown and neglected there within a season. It's not helped by the ground being as hard as a hard thing still. Attempting to split a division from the lovage has been put on hold until we've had more rain. We broke a fork taking up a section of the thuggish Horseradish for a friend. The Jerusalem artichokes seem resigned to sharing their space with docks. After the horrible wet summer of last year there were only a few rotting sunchokes left in the ground this spring. I gave up on them in despair, unable to find anything that seemed healthy enough to rescue then. 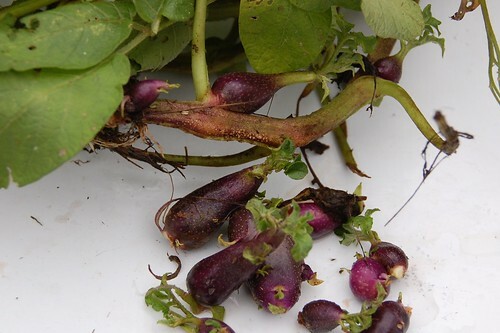 They've made a come back but as a vegetable crop they'd be much more productive in a weed free patch and regularly picked over to remove old and decayed tubers. Good King Henry battles on with bindweed, couch and buttercups. 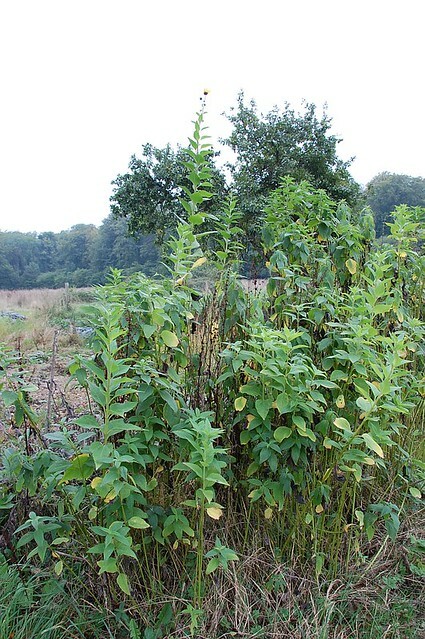 For one reason or another, I'm not sure what at all, I didn't even crop the Good King Henry this year, just left it to get on with it; under siege from various arch enemies particularly bindweed which is peculiarly well adapted to hiding in full view in the early summer with its similarly shaped and coloured leaves. And of course, as the Good King Henry is never lifted the wretched stuff can reside safely alongside even if the top growth is removed. I've already moved the Babington leeks and the walking onions are in pots to be planted out. The lovage will have to wait and a pot of elecampane is waiting to join the ranks. Must try harder. For the record, I planted a row of Cypriot ful today in the hope they will germinate and overwinter for an early crop next spring. Fingers crossed the mice don't take them. 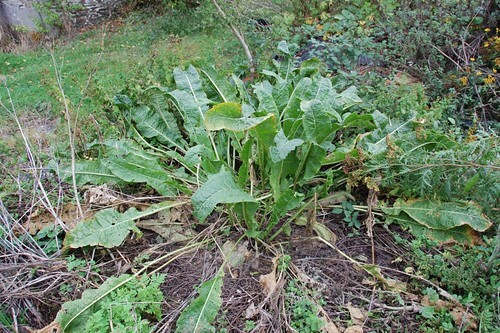 Horseradish is a violent thug which can't be moved on. It's really hard to keep it all in check all the time, isn't it? I've let everything go at one time and another, I've never found an answer that really works for me. That's comforting to hear. I think all we can do is try again if it's important and maybe learn to let things go that aren't.